Ben and I are trying to eat healthier so I made some make ahead lunches from runawayapricot.com for him to take to work. We were both skeptical at first about whether or not they would taste good. As soon as I tasted this rice though I was in heaven. It is soooo good! I gave it to my one year old too and he devoured it, so I wanted to make the recipe smaller so that I could make it just for a meal, but if you want to make some delicious lunches head on over here! 1. Put in rice, water, and olive into a medium pot and bring to a rolling boil over high heat. Once boiling, reduce the heat to low, cover, and simmer without opening for 40 min, making sure the water hasn’t all evaporated. 2. Meanwhile, dice onion, chop garlic, and slice scallions. 3. Cook vegetables with 1 TBS of olive oil in a large skillet over medium heat. 4. Add turkey to the skillet and cook for about 10 min until browned. 5. Add diced red pepper and season with the seasonings to taste. 6. Stir in half a bunch of cilantro, finely chopped. 7. Add cooked brown rice and adjust seasonings to taste. Thank you for this recipe! It sounds so good! I want some right now! I love new rice recipes. I'll definitely be making this very soon. Pinned! This reminds me of fried rice, which we love, so I'm sure we would love this too. Pinning. Looks delicious Kimberly! Pinned and shared! 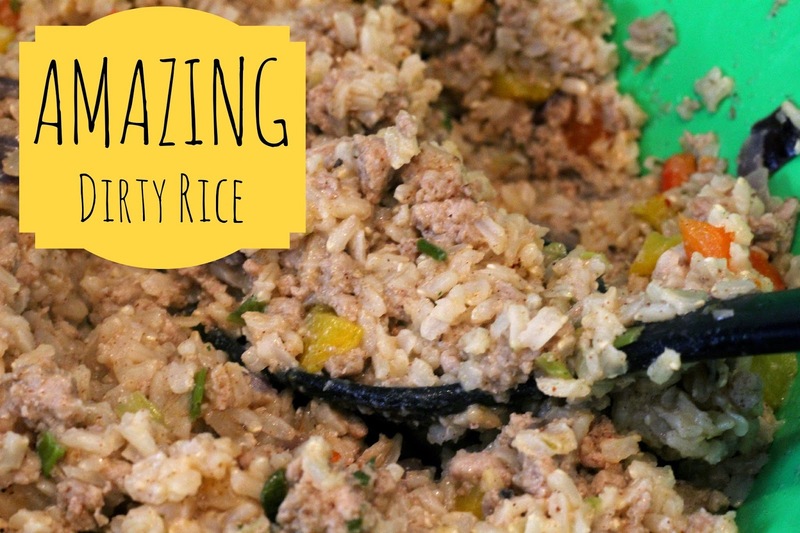 My mom makes dirty rice, and I want to try this recipe! Thanks for sharing at Submarine Sunday!! Thanks for sharing with the Say G'day Party Kimberly! Pinned Look forward to seeing you next week!